We arrive via the 7 train on the Long Island Rail Road, as before, and walk out to the Open under the archway sign: Abandon All Cash Ye Who Enter Here. Well, perhaps that’s an exaggeration, but some of the prices do make it feel that way. 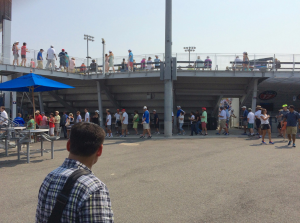 On the flip side, I have to commend the vendors at the Open, they have really upped their staff’s friendly quotient. This year we’re frequently greeted with, “Hi, welcome to the US Open, what can I get you?” or similar greeting, combined with equally warm goodbyes and, quite frankly, it’s very nice. It was great to see Fish back on court, beginning of course with his first tournament this summer in Atlanta. However … he does look like a throwback to another era with shorts that don’t qualify in any way as short, and those peds. I don’t think any male player looks good in peds. Of course that’s complete gender fashion bias, and yes, if wearing peds let me play like Agassi I’d never wear anything else. Short of that however, it’s not a good look for guys. As reported, we watched Alize Cornet play Kurumi Nara on Wednesday. What went unreported was that Cornet had a towel on court, kept by the ball chasers (many of whom are way past being called kids), which she asked for virtually every time she breathed. Oh, okay, maybe not quite that often. But it seemed like it. Conversely, Nara had no towel. None. As a person who gives off a lot of sweat glow, I’m not against having a towel with you at your end of the court, but if one player doesn’t need one at all while the other is going to it incessantly, some part of the towel’s use is just silly and unnecessary. In the case of Mardy Fish, he hits a return, either misses or Lopez misses his first shot, and Mardy goes to the towel. This happens again and again. Meanwhile Lopez, like Nara, plays towel-less. Something’s out of synch here, people. If the folks who think tennis needs tweaking (see: Tom Perrotta in the WSJ, among others), they should start with this ridiculous towel fetish and the other tics of modern players before messing with tennis’ scoring system. We’re sitting in the eastern, topmost seats of Armstrong stadium so we can look down into the Grandstand and enjoy two matches at the same time. I know Madison Brengle is playing Anna Tatishvili behind us. The two women are similar enough in physique that it isn’t immediately apparent who is who; at first glance I think the knee high socks on one of them is a clear sign that she is Brengle. I’m wrong, it’s Tatishvili. Bethanie Mattek-Sands’ influence is spreading. That’s a good thing. Like Nicolas Mahut, Lopez has worked hard on his game as he’s moved into the latter years of what’s been a long career (he’s 33). Mahut’s done well, Lopez’s results have been greater. His serve, always a strong point, is more potent today than ever; more fluid, more penetrating. He casually hits 132 to the outside in the deuce court. I should only age so well. On a set point for Lopez, Fish shanks a googly-lob forehand return that lands in and wins him the point. I mention what I’d said to Michael when he’d done something similar in our dubs against him on Sunday: Better shanked than never. Meanwhile, a quick glance at the big scoreboard shows that David Ferrer, playing on an outside court, is doing his typical thing: taking the tennis equivalent of 25 words to say five. He’s playing Filip Krajinovic. He wins 7-6 in the third, avoiding a four or five set match and having to write another War and Peace. I’m confident that even the most piercing interviewer in the world couldn’t get an active pro to chime in on this topic, but at 2-4 down in the first set we discuss whether Lopez feels any anxiety. This is similar to our chat about Gasquet v Kokkinakis on Wednesday. Graham and I agree that television commentators’ hype aside, the answer is no: seasoned players who are 18th seeds aren’t quivering in fear when down a break early in a match to players ranked far below them, much less someone like Fish who’s been away from competition for so long, regardless of how dangerous he can be on any one point. This proves to be true, and a great lesson for club players who want to even out their own performances; eventually Fish fades and Lopez wins in five: 2-6 6-3 1-6 7-5 6-3. Before that ends, however, Brengle-Tatishvili is finished on the Grandstand and Raonic-Verdasco get started. Balls hit on the Grandstand have a particular pop to how they sound, I know, but it’s still interesting to hear how Lopez’ 135 mph serves sound versus Raonic’s. The Canadian’s go Pow!, while the Spaniard’s are more whoosh-like. Some serves are fast, the best are fast and heavy. Graham says he’d be happy with consistently finding the location he aims for. One last comment before leaving our perch in Armstrong and the matches we saw from there: God bless the child who hits overheads. All four of the men we’re watching are happy to do so, and as I recall Brengle was, too. I am so tired of seeing pros (pros!) let lobs come down so they can hit either high forehand swinging volleys or, worse, bouncing high forehands. Years ago, in some book on tennis instruction, there was a photo of Harry Hopman showing Billy Martin how much angle was available with a smash by having Martin climb a ladder and look down into the court from up close at the net, replicating the height at which overheads strike the ball. Why are teaching pros and coaches letting their students give up such an advantage? I don’t care how good your swinging volley or high forehand might be, they cannot be as decisive and consistent as a well-tuned overhead. They simply cannot grant as many options or as much angle since they’re hit further away from the net and at a lower height. The open stance groundstroke has many advantages. I will not go into them here, but obviously they exist. On the other hand, committing to the pivot-and-load technique has stopped too many players from ever learning that’s it’s not the quickest way to some balls, that they just have to turn and run. Instead, they hold onto pivot/load and kind of crab-walk across the baseline, only reluctantly setting their lead foot out across the rear leg; “lead” and “rear” have less meaning with open stance shotmaking, but you know what I’m getting at. The point is, at some stage you have to recognize that you gotta get from A to B really, really quickly – that you can’t play this point from 4’ inside both side lines – and that a full on sprint is required. To do this your legs have to cross over one another. If you’re right-handed, your left leg has to cross over your right in order to move as quickly as possible to a forehand. Shuffling sideways and maintaining your pivot/load stance doesn’t get the job done. What prompts the Open’s organizers to play loud music continually in the square in front of Ashe? Do they really think it adds to the event? Or, and this is probably more to the point, are they working a playlist of mostly 20+ year old music to appeal to the attendees’ core demographic? Want to know how influential Federer is? At the practice courts on Thursday, we see Serena working with Patrick Mouratoglou. She’s laying in dolly second serves, three-quarter pace at most, and her practice partner is chipping or short-hopping them and rushing the net. Williams then hits her initial passing shot, and they repeat the process. It’s not at a stretch to see that Mouratoglou thinks Roger’s new tactic, which someone nicknamed SABR (Sneak Attack By Roger), will be copied by others and he wants Serena unflustered and ready when it happens. 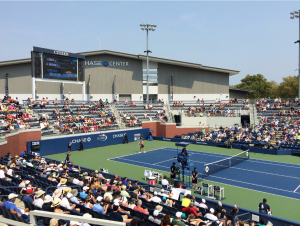 Courts 4, 5, and 6 lie next to each other at Flushing, and you can get seats behind either baseline of all three. If you put yourself either between 4 and 5, or 5 and 6, or in the middle behind 5, you can watch one primary court and two others as well. We’re there to see Philadelphian Lisa Raymond play dubs with Madison Keys against the team of Kirsten Flipkens-Laura Robson, and the Petkovic-Vesnina match is next door. We don’t see enough of it to get any sense the match’s story, but one thing is really obvious: when we saw Petkovic play Caroline Garcia on the Grandstand, the German was grunting on every shot, kind of a two stage minor grunt: an “oof” + an exhale. Against Vesnina she’s entirely silent. I’m not fan of grunting, while a admirer of Petkovic’s unwavering resolve point in, point out, in every match. It’s a conflict of interests, I know. Clearly I can maintain two contrary beliefs at the same time. Nonetheless, it provides no answer as to why she has a grunt per shot in some matches and not others. Garcia played silently, by the way, and Vesnina has a grunt that happens after her racquet touches the ball and lasts until the ball crosses the net. Is it possible there’s a separate coin toss for grunting, and one player gets to choose how it’s handled for the match? Hey, Ralph, with all the miracle fabrics around, why do the umpires and lines judges have to wear heavy cotton chino trousers in 90º heat? As to the current trends in pro tennis clothing, neon is the new black, but teal is making a big push. More regarding “tweaking” tennis: another thing to address way before changing the scoring is how competing players wear the same color tops. Is it too much to ask that one wear yellow and the other red, or green, or blue, or white, or salmon? Aren’t there enough trends in tennis clothing to make this possible? If you’re reading this, you’re no casual fan, but people who are would benefit from being able to tell the players apart immediately, like they can in other sports. All other sports in fact, come to think of it. And don’t get me started on mismatched doubles teams. Simple solution: higher ranked player chooses their kit, lower ranked player chooses alternate. The combined rankings of a doubles team establish who gets to pick. There. Solved. Let’s move on. For some reason, the big screen that hangs on Ashe and faces the central square is no longer showing the scores of all the courts around the grounds. Instead, it’s showing the match on Ashe and, I think, the match on Armstrong (can’t remember). I miss the ability to keep up easily with what’s happening, and use that to make decisions about what matches to go see next. Graham and I walk out to 17 to see Garbine Muguruza play Johanna Konta, alerted to Konta thanks to Pete Bodo’s article. On the way there we watch a player being escorted through the crowd, pretty clearly being chaperoned for a bathroom break. It strikes us that when that’s invoked at an outside court, it’s a long walk to any restroom they’re going to use for the players. Oh. Great. More of a delay in match play. Yes, that’s right: the line at the top left is the continuation of the line at the bottom, which stretches out of sight to the right. Court 17 is a great addition to the layout at the Open, as I’ve mentioned. On a hot day like today, though, it’d profit greatly from some of Slew Hester’s ivy being planted at the wall of the indoor Chase Center at the rear. At least it would make the place feel cooler. The first thing I notice is how well Konta moves. She’s really light on her feet, always a good thing for a tennis player. As we watch her through the second and third sets, her other assets become obvious: her shot selection is impeccable (I don’t know if we saw her choose one silly shot in two tightly-contested sets), her serve is tough, tough, tough (a steady diet of first serves, 56% for the match though it felt higher, and a consistent 100+ mph), and when pressed on her serve at one stage, at 0/30, she puts in a strong second serve in place of her first and draws an error from Muguruza. I’m not touting her for the Hall of Fame just yet, but if she doesn’t go on to have a strong career in the upper echelon of the game I’ll be surprised. Konta prevails, 7-5 6-7 6-2. After all that’s been written about this match, of which I saw only the first set, I can add only this: we went to the Grandstand wanting to see just exactly how much their two stiffy backhand techniques resembled each other. The answer: a lot. I leave it to you to find any other similarities at all. As a tennis player and cyclist, it occurs to me that that what’s happening in tennis, the trend of top-ranked players being older than they were a few decades ago, coincides with the increased physicality of pro tennis and the established arc of a pro cyclist’s career. In cycling, road racing to be specific, no one dominates the peloton in their early 20’s. They just don’t have enough strength yet. In the Tour de France there’s a separate jersey honorific awarded to the Best Young Rider. A whole separate category for young riders! As tennis has shifted to longer points, points of phenomenal hitting and running, is it any wonder we need to think of players’ best years in a way that more closely resembles the peak years of cycling’s road racers? Graham and I leave Queens after three days of intense and wonderfully enjoyable tennis spectating. Can I put in a plug for our hotel? It was The Paper Factory, in Long Island City (still Queens), only 30 minutes (or less) away from Flushing by public and with the subway stop 1 block away. Less expensive than being in Manhattan, with a restaurant and bar onsite, and nice décor, it’s a good find. We’ve had a great time. Graham’s intro to the US Open has been a success. Job done. Not sure I agree with the point about players lasting longer because the game’s become more physical. Logic would suggest the other way around in terms of strength and the demands of the game but I think you have to factor in experience as well. And if we’re talking about 30/40 years ago players retired earlier for reasons not always connected with tennis. You can get stats bit I don’t think they’d mean much. Thanks, cjb, for the comments. I’m not sure my suggestion about reasons behind the aging of the pro tour are entirely accurate either, but I believe it well worth considering. As much as logic might lead us to think a more physical competition would favor younger athletes, there are other sports besides road cycling where that’s not the case. Certainly experience plays a big role, as you point out, but so does a depth of conditioning and strength that is not available simply from being young. As to retirements of 30 or 40 years ago, I’m not sure about that at all. I was around then, well past playing in the juniors, and my recollection is that retirements were really, really rare. If you’re referring to something else I’d be interested to hear what it is. Again, thanks for chiming in. But generally I would maintain, as I have before here, that comparisons between generations aren’t particularly useful because the game has changed so much. That said, BJK played her last Wimbledon at nearly 38.And Martina continued into her 30s.But their generations overlapped. Also,I suppose it depends how far back you want to go. Well past the sell-by date on this, but watching Djokovic on The Late Show reminded me, in part, of one reason why the cycling/tennis comparo came to mind: look at Nole. Zero fat. He looks more like a member of the pro peloton than some guys who’re really there.